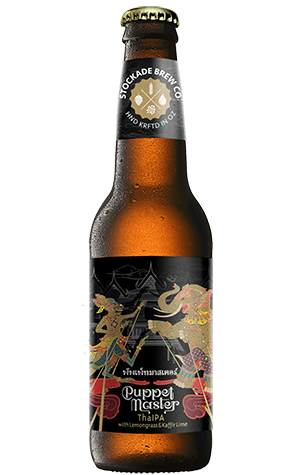 When a collaboration includes a brewery from Thailand, an Aussie bar with a Thai-focused menu, a local brewery prepared to play it loose with written English and the beer is a hoppy one, there was really no way this beer wasn't going to be styled as a ThaIPA, was there? Officially named Puppet Master, the beer is something of a companion piece to a collab released late last year between Sydney’s Stockade and Phuket’s Full Moon Brewworks, only this one adds a third collaborator to the mix in the shape of legendary Melbourne bar Cookie. Using the addition of lemongrass and kaffir lime as a hook, Puppet Master is a suitably citrusy drop, from the lemony aroma through to the palate where its grapefruit character mixes with a herbal spiciness. At just 5.5 percent ABV it’s a little on the light side in terms of IPAs, but you get the impression this is far more about function than it is about pleasing the people putting together style guidelines. On that, it’s the kind of thing that’ll tickle the tastes of those favouring the complementary rather than the contrasting when it comes to beer and food matching; sip one alongside a fresh and zesty Phla kung and your palate will be halfway towards a beach in Phuket.